Talbot, Sunbeam and Lotus are charismatic names among sporting motor cars. 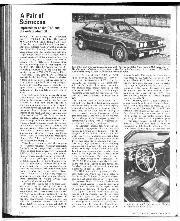 To merge them all together as the name for one car is to tempt fate and criticism, but if badge engineering has to he carried out to that extent then the Talbot Sunbeam Lotus will do little harm to the reputation of any of those famous marques. By any standards the first new model to bear the Talbot name has superb performance; by the standards of any other small three-door hatchback saloon — even the Vauxhall Chevette 2300 HS — the performance of this 2.2-litre, 150 b.h.p., Lotus-engined Sunbeam is absolutely sensational. Talbot claim a 0-60 m.p.h. time of 7.8 sec. 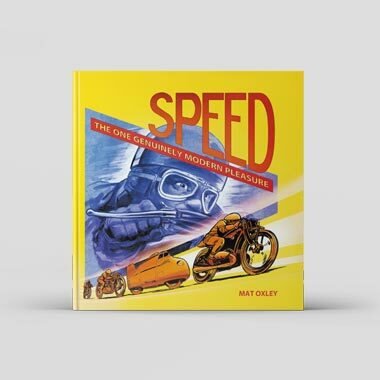 and a maximum speed of over 120 m.p.h. and while frenetic 0-60 acceleration isn't the be all and end all of a car's performance, in this "hot" Sunbeam's case it is a fair indication of the type of agility to be expected right through the range. In fact the Talbot figures are on the conservative side, if anything, for my barely run in, left-hand-drive test car reached the British single-carriageway speed limit in 7.5 sec. in the Auvergne region of France during one of the most exciting Press Launch drives I have had in many a long day. 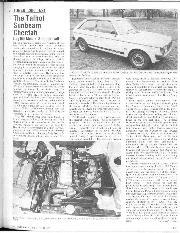 Motor Sport is produced in several different sections and that containing my road test of Stag Hill Motors' Talbot Sunbeam Cheetah on page 1481 was written and "put to bed" before the Sunbeam Lotus launch. 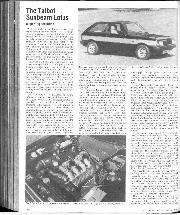 This will explain to readers why I could make no cross-reference to Sunbeam Lotus performance in that road test. Different gearing, limited slip differential and slightly lower weight made the 145 b.h.p., 2-litre push-rod Cheetah fractionally faster on initial acceleration, but the Lotus' greater torque (150 lb. ft. at 4,800 r.p.m. on an engine which revs. to over 7.000 r.p.m. against 120 lb. ft at 3,800 r.p.m. and a 6,500 r.p.m. rev. limit) gives better and less fussy performance in the rest of the scale. The Cheetah feels to have a "tuned" engine, the Lotus engine feels more powerful, but more "cooking". 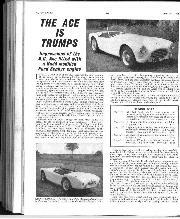 This is the only comparison I shall make, for while the Lotus is a very fast and entertaining production car it does cost almost £7,000 against the less sophisticated Cheetah's £5,500. Both are astonishing motor cars in their own rights. The Sunbeam Lotus, available only in black with silver side-stripes and Lotus badges on the flanks, is based on the Sunbeam GLS bodyshell, but that's about the extent of the relationship. The rolling shells are produced at the Talbot plant at Linwood in Scotland and then transferred to Lotus at Hethel, where Colin Chapman's lads insert a special 2,172 c.c. (95.2 mm. x 76.2mm.) 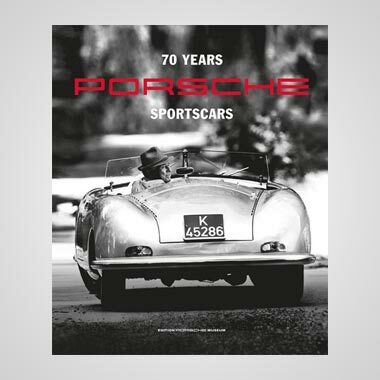 derivative of the all-aluminium, twin-overhead-camshaft, sixteen-valve slant four engine, type number 911, attached to a five-speed ZF gearbox. This longer stroke engine (the standard 907 Lotus 1,973 c.c. power unit has a stroke of 69.3 mm.) will eventually find its way into Lotus models. It uses the existing "E" cams, 9.44:1 compression ratio and twin Dellorto DHLA 45E double-choke carburetters. Exhaust gases exit through a four-branch manifold into a single pipe, through primary and secondary silencers into distinctive twin tail pipes. Electronic ignition with diagnostic plug facility and a thermostatically controlled electric fan are fitted. Comparative figures for the 1.600 c.c. Sunbeam GLS and Ti models are 80 b.h.p./86 lb. ft. and 100 b.h.p/96 lb.ft., showing the extent of the Sunbeam Lotus' extra punch. To cope with it, the cable-operated Borg and Beck clutch is enlarged from 7:5 in. diameter to 8.5 in, and the live rear axle has stronger crown-wheel and pinion and thicker tubes. Thanks to an overdrive fifth gear ratio in the ZF gearbox, it has been possible to lower the standard Sunbeam final drive ratio to 3.89:1. Lotus engineers developed the suspension, using different shock-absorber settings, a thicker front anti-roll bar and stiffer mounting and reaction bushes to improve handling responses. It seems that Talbot engineers are so pleased with the Hethel-proved results that some of the bushes are likely to find their way on to the Ti to improve its response. The standard Sunbeam rack arid pinion is retained. All that "go" is stopped by thicker, 9.5 in, front discs with larger calipers and competition-type pads and normal 8 in. rear drums with larger wheel cylinders. Brake failure and front pad wear warning lights are fitted. The alloy wheels are of 6J width shod with 185/70 HR 13 in. Pirelli Cinturato CN 36 tyres. Very comfortable, high back, wrap around, reclining bucket seats with adjustable head restraints are the most obvious interior modification. Grey cloth upholstery is fitted throughout. A new centre console is unique In this Sunbeam model, which includes radio, tachometer, rear window wash/wipe, laminated screen, halogen headlights, fog lights and a simulated leather, thick-rimmed, three-spoke steering wheel as standard equipment. Down in the hot and sunny Auvergne we journalists had a Sunbeam Lotus each, which left me unfettered by the usual considerations for passengers, and the splendid 200 km. route was practically devoid of traffic round the crucial twisty bits in the hills and forests. Fifth gear was virtually redundant most of the time, but when employed on the occasional long straight could be stretched up to 5,600 r.p.m. (21.65 m.p.h./1,000). Overall performance practically speaks for itself — magnificent! The temptation was to scream the engine up to the 7,000 r.p.m. rev-limiter (35 m.p.h., 62 m.p.h. and 87 m.p.h. in the lower gears), but the excellent torque made this a largely unnecessary exercise. The test car had the sweetest ZF gearbox I can recall, but whether it will be as good from the right-hand seat as I was from the left (there is strong spring resistance to overcome into the 4th/5th plane, a pushing action from the left, pulling from the right) remains to be seen. As always, there are bound to be customers who complain about the ZF pattern of first on a dog's leg down to the left. Strangely, the traditional ZF rumbling in neutral was absent. All that power in such a small, short wheelbase motor car sounds like the recipe for lethal handling. That idea can be dispelled, for the Sunbeam Lotus is unexpectedly predictable, safe and forgiving, though not without quirks. 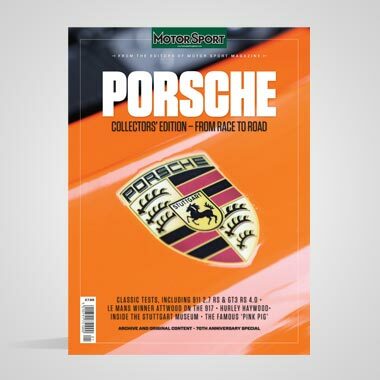 It's essentially a very neutral car and any attempt to hang the tail out simply scrubs off speed. The Pirellis grip tenaciously in the dry. Lifting off the throttle turning into a corner or in mid-curve tucks the nose in to tighten the line. This tautly-suspended Sunbeam does skip around a lot on bumpy surfaces, disconcerting on first acquaintance, until one learns to let the car take care of itself, or even use the trait to help set up the car into a corner. Heavy throttle applications out of tight corners show up the expected traction deficiency, which only a limited slip differential would cure, but Talbot decided against fitting one as standard. Under most circumstances traction in the dry is perfectly adequate, but it could be more of a problem in the wet. 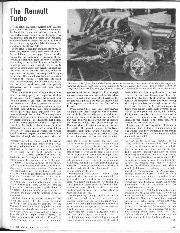 Underbonnet restrictions demand that left-hand drive cars must use twin, remote brake servos, while r.h.d. cars have single, direct acting units. As a result the l.h.d. test car developed a "long" pedal and lacked the brake feel which UK owners can expect. But brake effectiveness was excellent and the front pads resisted fade even when smoking merrily. Gentle pottering through small towns and a traffic jam caused by a cycle race gave my Sunbeam Lotus chance to prove that it had rather more to offer than lightning performance; so fast and so raucous when opened up, it was smoothly flexible and quiet when reined back. Early cars have a totally inadequate, 9-gallon fuel tank, but a larger tank is on its way. Although something of an homologation special (Group 2 homologation is expected by the end of the year, on the basis that Talbot/Lotus can satisfy the FIA that a minimum of 1,000 will be produced in 12 consecutive months), this little Sunbeam is much more than that. 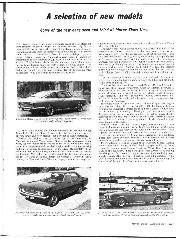 For the new Talbot concern especially and Chrysler across Europe in general it is very much an image maker, as the current advertising campaign shows. For the ordinary customer it seems to be a thoroughly tractable and practical proposition for everyday road use, for which it is insurance rated as Group 6, and I look forward to analysing it further under normal UK road conditions. Tony Pond is already proving the model's worth as a rally car and 4 full-scale rally programme is planned with cars run out of Des O'Dell's Coventry Competitions Department and Boulogne. Every conceivable modification will be available for the competition-minded owner. A minimum of 4,500 Sunbeam Lotuses are projected over the next three years ("Give us the orders and we'll make as many as they want." said an enthusiastic Rudd, who seemed well pleased with the Lotus-Talbot liaison), for sale in the UK, France, Italy, Germany, Belgium, the Netherlands, Austria and Switzerland, through selected dealers. 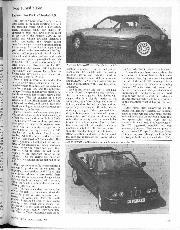 The car impressed me as the most exciting small sports saloon for years.. Unfortunately the police think so too, so watch out for innocent-looking Sunbeam Q-cars!